The beach is always a good idea—you’re not the only one who doesn’t like to bare it all in hot weather! There are no hard and fast rules about what to wear to the beach, so looking stylish while staying in your comfort zone can be a breeze with these tips. Keep reading for our Stylist tips on what to wear to be covered up at the beach! 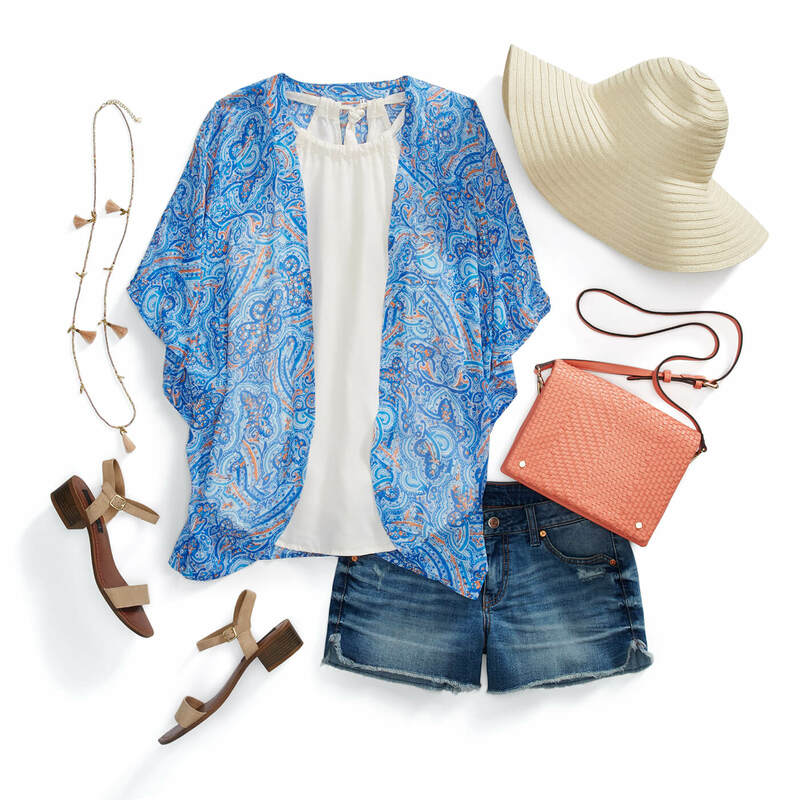 Kimonos, cardigans and tunics all provide lightweight coverage without sacrificing style. An open front style like a kimono or loose-knit cardigan allows for a peek at your swimsuit while covering your backside and keeping the sun off your shoulders. Skirts and dresses are our favorite summertime wardrobe staple to have in our closets. For a day at the beach, choose a lightweight dress in a gauzy fabric. Maxi skirts and dresses are still in with fashion girls everywhere, so rock one at the beach too! Stylist Tip: Keep your maxi dress from dragging on the shore by tying the hemline in a knot, off to one side. You’ll still be able to dip your toes in the surf without having a soggy dress to dry! Summertime calls for shorts and there’s no better way to wear them than at the beach! Choose a length in your preference, noting that 6”-12” inseams offer more coverage and are easily cuffed to show a little more leg. Shorts pair perfectly with a tank and kimono for a look that gives you different un-layering options as the temp rises, too. When in doubt, wear what feels good and the rest will follow. Given the setting, nobody will be worried about what you’re wearing, anyways! Set your insecurities aside, pack up your beach tote and don’t second guess your ensemble! What’s your favorite thing to wear at the beach? Share in the comments!